Treasure Valley Casino is a governmental enterprise of the Chickasaw Nation, (“Nation”) a federally recognized sovereign Indian tribe. Treasure Valley Casino is giving away Mega Frenzy Bingo Tickets during the “Mega Frenzy Earn & Get” promotion. Patrons must be 18 years of age or older with a valid photo I.D. and must be a Treasure Valley Casino Players Card member, with complete and accurate account information, to participate. The following individuals or entities are not eligible to participate or win during this promotional activity: employees of Treasure Valley Casino; employees of the Nation prohibited from participating as set forth by any of the Nation’s policies, regulations, or laws; anyone who has been barred from any of the Nation’s gaming facilities; or any promotional sponsors. Every day from October 1, 2018 through September 30, 2019 qualified Patrons will be eligible to receive $5 in Mega Frenzy Bingo Tickets. 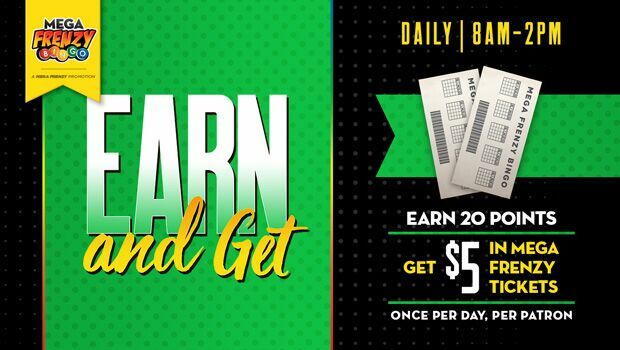 Patrons must earn a total of twenty (20) points in one (1) day on their Treasure Valley Casino X Card, by playing electronic gaming machines during the qualifying time period, and reporting to the Players Club. Qualifying time periods are from 8:00am to 2:00pm each day from October 1, 2018 through September 30, 2019. Patron(s) must be present to win. Limit of one (1) prize per Patron per day during this promotion. Treasure Valley Casino’s casino management system will be the sole determinant of each winner. Winner(s) are responsible for all applicable taxes. Winners will receive a W2-G and/or a 1099 tax form, when applicable provided by the Chickasaw Nation. Acceptance of prize constitutes winner’s permission for Nation to use his/her likeness or name for publicity or promotional uses without compensation or notice. Winners must agree to sign a publicity release form before prize will be released.